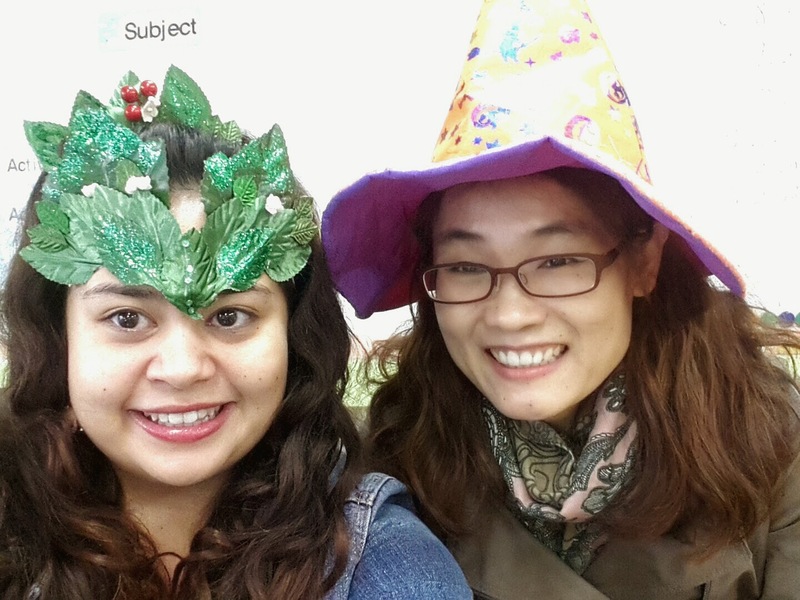 Hello all, since this Friday is Halloween we are going to have Halloween themed lessons and take a short break from our textbooks to have a little fun. And I thought I would post my lesson plan and materials before Halloween so that you all can make use of them if you've not yet planned. I will post photos of the lesson with the kids after Friday the 31st. Greeting: "Happy Halloween!" , go over date and weather as usual. FIRST - there should be music! And what better groove than the Monster Mash? We'll play a " Pass the Pumpkin Game"
The kids stand in circle and pass a pumpkin around while the Monster Mash music is playing. When the music stops (stopped by the teacher) whoever is holding the pumpkin is ‘out’ and must sit down. The winner is the last person holding the pumpkin. They get a Candy. Simple Number Music Game - play the Monster mash video and get the kids to dance. When you stop the music yell a number and tell the kids that they must make a group of the said number. They catch on pretty quick. The kids who are left over from the groups made are 'out' and I usually give the remaining 4 a candy , they're the winners. AFTER THAT - Quick Halloween PPT with fun costumes (kid friendly) to look at also. 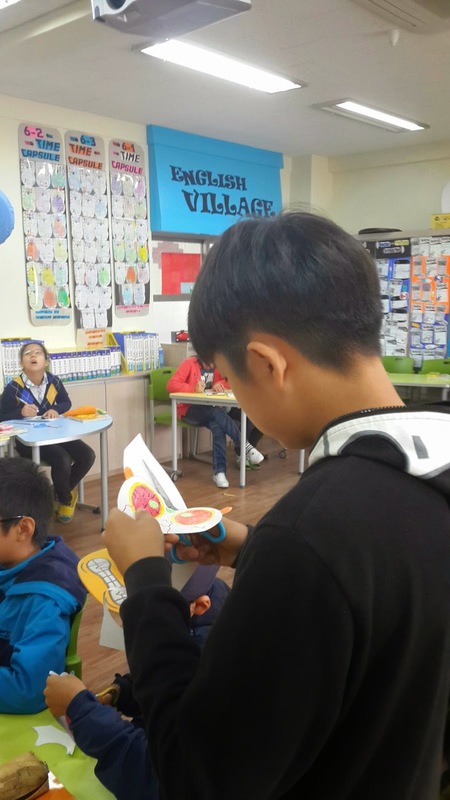 I got this PowerPoint from Mes English .com where there are heaps of fantastic Halloween resources and more printables - as well as other themed classes and regular resources! A great site to bookmark! * Note: I made changes and added a couple slides to the Powerpoint to make it a little more interesting. Changes include a pop up picture of a kid in a cool Halloween costume based on the slide vocabulary. (see above sample slides). AND THEN - HALLOWEEN BINGO! 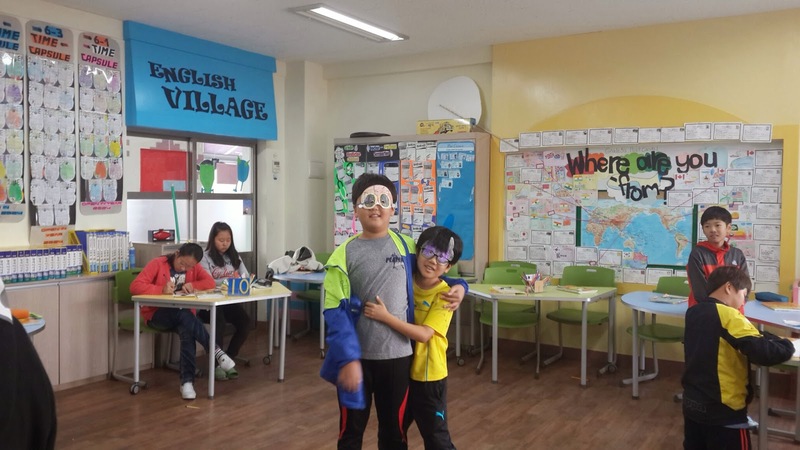 – a chance to give out candy and study a little English (vocab from PPT). You can either use my bingo 'strip' cards below or use regular bingo cards from Mes English. com (click here for bingo cards). How to play Special "One strip bingo" – each student gets a strip of Halloween themed pictures. When the teacher calls out one of the Halloween words the student may only rip off the picture called if it is on either end of their strip. The teacher says " There is a black cat!" Minsu can rip off the black cat picture. 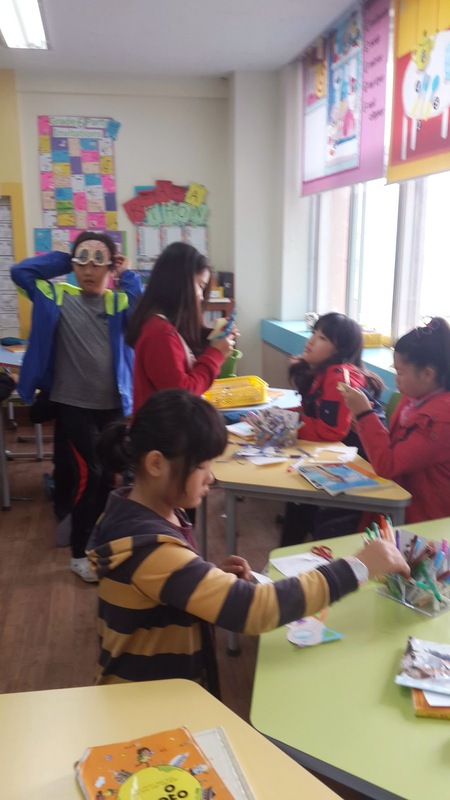 The teacher says "There is a candy!" Minsu cannot rip off a candy because 'the creature' (Frankenstein's creation) is blocking the candy. Get it? It's easy to do and less paper used. And for the FINALE ! If you are working with young ones I suggest skipping paint and using felt tips and crayons instead. I got these fantastic mask templates free from Mr. Printables website. you can download them coloured or blank. 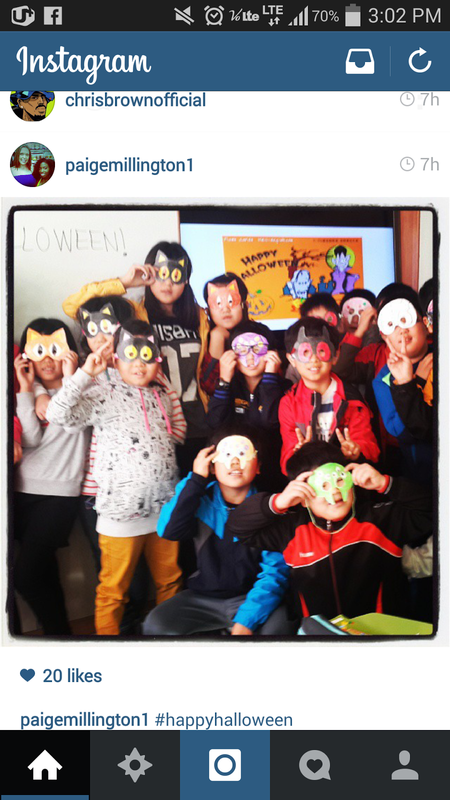 My collegue's Instagram of her class in the masks ! And the PPT in the background. Debating: Bring hair dryer for fast drying? Now, this may look like a jam packed lesson so I suggest if you are worried about time - to skip either the bingo or pumpkin pass game. I am also thinking to hold the bingo until later, perhaps after the masks - then if we have time we play, if we don't, we don't. It's all good. As long as they enjoy Halloween! Tip: try to have finished the song, pumpkin pass and PowerPoint done after 10 mins, -15 max. You can speed up the bingo and pumpkin pass as you are in control. Make sure to be looking at the bingo strips as you call also , so you can create winners faster also. Well, I wish you luck and a Happy Halloween!